I began college and spent 3 years at the Colorado School of Mines before transfering to the University of Saint Mary in Leavenworth, KS. I completed my bachelor’s and master’s degrees at USM. I have also done coursework towards district licensure through Wichita State University and ESOL endorsement through Newman University. I regularly attend the KEEN Math and Science Conference, KSDE’s Impact Institute, and the KATM Conference. I have also attended several KSDE Regional Trainings. I am currently enrolled in two different classes focused on using the Growth Mindset in math classes offered through Standford. Given any opportunity to improve my craft, I’ll jump at it. I began teaching at AHS in 2012. I have experience teaching Informal Geometry, Geometry, Algebra 2, Trigonometry, Pre-Calculus, and Statistics. 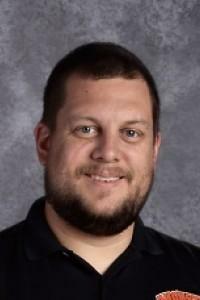 In the math department, I am typically the teacher that organizes math competitions, especially those put on by Pittsburg State University and Emporia State University. I am the National Honor Society sponsor as well. I also hold the roles of Building Advisor for Augusta High and Co-Teaching Coach for both the high school and middle school. In my experience, I have taught every class from 7th Grade Math up through College Calculus. My wife, Kara, and I got married in 2007. We have 4 children: Bryce, Luke, Ryan, and Hannah. My children currently attend Lincoln Elementary. I enjoy teaching and learning, and most of my hobbies involve at least some aspect of that love. I also enjoy reading, especially science fiction and fantasy novels, and am a bit of a gamer. Most of my free time is spent chasing my children to their different practices, scouting events, and clubs, and I coach or sponsor several of those activities.